The Fergies are one of the headline acts at this year’s Indigi Day Out on Saturday 2 June 2018, raising awareness of veteran trees at Redland’s IndigiScapes biggest event of the year. 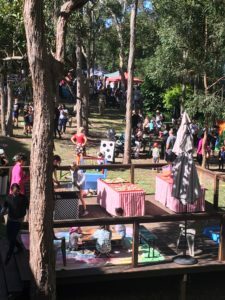 Redland City Mayor, Karen Williams said Indigi Day Out and Folk Redlands Festival of Music was an iconic event on the IndigiScapes calendar, drawing crowds from across the south east region. This year’s theme is all about the importance and value of our veteran trees that not only provide shade in the heat, and the air that we breathe, but provide sanctuary for wildlife in their old, gnarled limbs. “We’re privileged to have renowned singer/songwriter, guitarist, didgeridoo player and artist, Joe Geia performing as Indigi Day Out marks the end of National Reconciliation Week and the opening of the Quandamooka Festival,” Cr Williams said. “The folk music provides a fantastic atmosphere under the trees, and this year’s line up with local Redland performers Mama Juju and the Jam Tarts, Diddly Squat, Noisy Plumbing and other great acts, set the tone for a fantastic day out. Indigi Day Out is a celebration of the Redlands’ environmental character and its cultural heritage. Cr Williams said nature is a great tonic for our busy and stressful lifestyles, so take the time to appreciate some of our beautiful established trees that can help ease anxieties and improve your mood. “If you have questions about bushcare, environmental partnerships, wildlife, waste reduction, waterways, or want some tips on having a wildlife-friendly backyard, come along and talk to our knowledgeable IndigiScapes team. “With a host of exhibits, displays and talks, as well as native plant sales, there will be something for everyone,” Cr Williams said. Activities include Sparky Do Dah Nature Play and bushwalks, gumnut craft with local artist Karen Benjamin, weed weaving a new ephemeral hut for the playground, story cloth art, face painting including an exhibition of full body painting by Fairy Raine, and Geckoes wildlife displays for the kids. Kick back at the end of the day with Helen Ashworth, an accomplished contemporary storyteller- in-song, who will delight with her guitar rhythms and song.